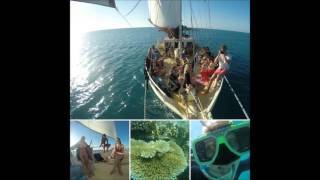 Have you tried overnight sailing around the islands of the Great Barrier Reef? If you are short on time, budget or unsure if you would like to spend more than one night on a boat, then this is the option for you. Tick off all the highlights over two full days and one night under the stars of the Southern Cross. They offer a variety of cruises ranging from the young and fun to small group family friendly experiences. Sit back and relax aboard the beautiful classic Waltzing Matilda, with a great reputation for comfort and value. If you are looking to escape large crowds (only 14 guests) Waltzing Matilda provides the full experience. Affectionately known as the “Beach Boat”, the SV Whitehaven will allow you to fully relax, forget about everyday life and sail away to a slice of paradise. 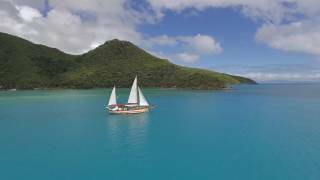 Sail around the Whitsunday Islands aboard a 70-year-old ketch for a full two days/one-night adventure on Summertime, with the extras like a Jacuzzi, kayaks for all passengers and fully air-conditioned vessel. Affectionately known as the “Beach Boat”, the SV Whitehaven will allow you to fully relax, forget about everyday life and sail away to a slice of paradise. Learn to sail, enjoy fun kayak tours and snorkel over fringing reefs in secluded coral bays. Of a night time, lay back on the deck whilst their formally trained crew guides you around the constellation of the southern hemisphere. Kayaks on board for your own leisurely adventuring in breathtaking bays. Informative Star talks under the southern nights sky. Snorkelling in two separate locations. Get Involved!! Hoist some sails with the crew and learn about the key points of sailing. Educational chart talks about the Whitsunday Islands, their history and the Eco Systems in which you will swim and explore. Completely covered seating and dining area for year round protection from weather and sun. Bush walks with their experienced Tour Guides to Hill Inlet lookout and Whitehaven Beach. Fun, relaxing and accredited Eco Safari Tours. Extra top deck space to move around, sunbathe and stargaze. A fun social tour for the young and young at heart. Sit back and relax aboard the beautiful classic Waltzing Matilda, with a great reputation for comfort and value. If you are looking to escape large crowds (only 14 guests) Waltzing Matilda provides the full experience. Visit and swim at the world-famous Whitehaven Beach, bushwalk to Hill Inlet look out, snorkel the most amazing fringing reefs, relax, run barefoot on an unspoilt beach and anchor at a picturesque bay. Gypsy Dancer is performance sailing at its best on an 18.5-metre pocket maxi racing yacht in comfort and style. With good deck space and spacious comfortable accommodation below makes it perfect for the young, fun and adventurous traveller wanting a social experience with all the best that the Whitsunday Islands have to offer. Formally a racing yacht this vessel is simply awesome to sail aboard, with credited offshore ocean races including the famous Australian event the Sydney to Hobart. They carry a maximum of 22 guests with friendly experienced crew. You will also get a chance to help out with the sailing or you can just kick back and relax in the tropical sunshine and enjoy awesome boat life! Gypsy dancer offers open plan living, with two toilets and two showers, a saloon area and fully equipped galley.